The Z stands for ‘Zwn’ ? It means ‘Life’ in Greek and Z-factor is a weekend that will help you ‘control’ your health eternally. Leave those short term diets, those short term fitness regimes that start, stop, start ,stop ….then stop to one side. As you are aware, Joseph, who has been Tony Robbins’ top nutritionalist and health expert for over a decade, has been working on the art of the ‘perfect’ energy regime…forget diets, this is the way forward into how to control that weight, increase that energy level to your optimum, learn how to walk, talk, eat and sleep with quality, thus creating an abundance of success. If I told you it’s not the hours you sleep that count but the quality of it that determines your mood, energy, mindset when you wake up and how he will teach the secret of sleeping properly, wouldn’t that excite you? He will teach you to look good AND feel good, no point in looking it if you’re not feeling it, and no good feeling it if your not looking it, exciting stuff….and there is much more, for example how you can have the energy of a top athlete with just 4 hours sleep …this is pure detox for the soul and mind, designing the ‘Z’ factor in you, dare you miss this opportunity? 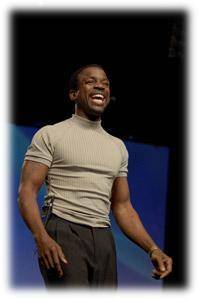 Joseph McClendon will use to help you reverse that ageing process, that existence habit of your health. The seminar over 3 days is Joseph’s Life Work, Joseph is over 57 and looks 35 and when he gets to 95 he does not want to look much older than he is now. If you knew the five real secrets of being youthful, how would that make you feel? This is not about weight loss. This is about life control. In this seminar we will show you how to arrest the ageing process, reverse the ageing process and start the rejuvenation process. The way we breath, the way we sit, the way we eat, the way we sleep and most of all the way we look and feel. This seminar is not just about looking good it’s about feeling good and if you feel good from inside it’s important you look good from the outside. Imagine having the energy of a world class athlete on only four hours of quality sleep. Finally this seminar will also show you how to increase your libido and sexual energy of you and your partner ………. Does that excite you? Only 100 people can attend this event. If you are unexpectedly unable to go to the seminar, you can replace yourself by a colleague, for free, provided that you tell us in time. Cancellation is only possible by registered mail, until three weeks before the seminar. For this we charge you the sum of 25% of the ticket price for cancellation. From the time of three weeks before the seminar you are due to the complete participation amount. For more information about this seminar you can contact Success Guide on +31 75 612 19 48. Our employees will gladly give you the wanted information.